You can never expect to bag a job at a good company if you do not have a well written resume. At some point of time or the other, all of us have drafted a resume for ourselves. But how many of us have actually taken the time out of our busy schedules to go ahead and post an online resume for ourselves. Many people have not made virtual resumes for themselves because they are unaware of how useful and advantageous it is. If more people were aware of the benefits, they would all rush to post a resume online. In this day and age companies only want to hire those employees who have a powerful online presence. If you have no online presence nowadays then you are as good as being nonexistent. No company would like to hire an employee who is unaware of how to use social media like Facebook, Twitter, Skype and Google or does not know how to make use of simple technological gadgets like a Laptop or Tablet. Having an online resume is not very common, so if you are one of the few people who posts you resume online then you silently communicate to the recruiter that you are technologically advanced. Posting your resume online becomes especially beneficial when a company is looking to fill in a post immediately. Most companies cannot afford to have work piling up each day and rather than having a long drawn out recruiting process which takes a couple of days or weeks, they prefer to just scan resumes online and get in touch with people who they think will fill in the position well. This is one of the main reasons why people opt to have online resumes. Rather than you having to go from place to place with your resume, trying to get an appointment with Human Resources, doing things online is very effective and beneficial for all concerned. Chances are you will have posted your resume online, only if you are seeking employment. Given the present economic condition, getting a good job is very tough indeed. So if you have been trying to get a job for a considerable period of time, but have been unsuccessful in your endeavors, then try posting your resume online, you are bound to get instant results. This having been stated, please note that there is no guarantee that you will get a response instantly, but you should do whatever you can to get yourself out there, so that you can get a job faster. When you have a hard copy of your resume, making changes to it is rather tough to do, especially if you do not have a printer at home. A major benefit of having your resume online is that you can update your information rather simply, with a click of a button. If you have just completed a course or been awarded some certificate, then you can include this information in a matter of a few seconds. Editing is a task which all of us dread, but when you are working online, things become rather easy. If you are someone who has been going from pillar to post trying to get a job, this is simply because you have been unsuccessful in getting companies to sit up and take notice of you as a worker. Posting your resume online gives you visibility which you cannot even imagine. The better your visibility the more chances of you getting a good job. If your resume is impressive and you have ample educational qualifications to back you up then you are bound to receive an email or two rather instantly. You will indeed be spoilt for choice with the number of offers you will receive. As we are all well aware, companies have a lot of paper work to worry about, whether it is in the form of bills, receipts, contracts, letters, notices, legal documents etc. Every company would prefer to have things done virtually rather than having to unnecessarily adding to the paperwork which they have to tend to. So if given the option between sending in your resume by post or posting it online always choose the second option as it is bound to be a safer bet. Keep in mind that members of the HR department constantly check their mail and if you contact them about your virtual resume they are bound to do the needful. With today’s technological advancements things have become rather easy and there is ample information which is available before us simply by the click of a button. Technological advancements have made it very easy for us to make our online resumes look so good and unconventional. If you are someone who is inspired and bursting with ideas then this is a medium which will allow you to really channelize your energies in the right manner. With an online resume, you can make use of templates and colors which will really make your resume stand out. A great thing about posting your resume online is that it can be done from the comfort of your own home. In today’s gadget age everyone has a computer and an internet connect, therefore it is indeed an easy task to post your resume online. So no matter how busy you are with other preoccupations doing this won’t require even a bit of your effort. Rather than having your resume simply in one format it is always a better option to have a resume in a variety of formats so that it really betters your chances of attracting more attention to yourself. If you sit quietly and do not make an effort to get yourself on the map then bagging a job will be impossible for you. The more effort you take for yourself the better it will be for you. No company wants an employee who is not willing to do whatever it takes in order to get the job done. If you do not believe in yourself then which company is going to hire you? Today, the importance of networking cannot be stressed upon enough. Posting a resume online allows you to not merely broaden your horizons but also broaden your network. Networking in the corporate world serves the same purpose as business social networking. It allows you to really get yourself into the helm of things. You should not shy away from spreading your wings and taking things to the next level. When you are sending in a copy of your resume it is a well know fact that you have to try your best in order to edit your details a great deal so as to ensure that your resume does not become too lengthy or wordy. In today’s corporate world, no one has the time to read a long resume. The great things about an online resume is that, since most often information is provided in a palatable and appealing manner, you can take the liberty of making your resume a little longer and packing in some more information about yourself which you believe will give you an edge over the rest. The worst part about sending a card copy of your resume by mail is that there are chances that it is going to get lost. Very often even if your resume does reach the office, it just becomes one of the many envelopes which the employees do not even have the time to tend to. Having your resume online is good as it is available for anyone who is looking to employ a person onboard. This system keeps things rather simple and you do not have to be submissive or meek in front of anyone. At the end of the day a hard copy of your resume is nothing but a piece of paper and there is nothing much which you can really do in order to make it stand out and come alive. When you have an online resume, it allows you to really go out of your way in order to make your resume impressive and individualistic. You have the freedom to present things as you like and no longer your resume is a boring summation of all your educational qualifications and skill. Spend time in creating an impressive online resume and you are bound to leave a lasting impression in the minds of those viewing your resume. Posting your resume online is advantageous especially if you are in an unconventional field of work, where more important that mentioning your degrees and qualifications is providing examples of projects which you have worked on and successfully been able to manage. For example if you are a designer, though having qualifications is important the recruiter will be more interested to see the kind of work which you have done. An online resume allows you to really outdo yourself by posting audio clips, pictures and even videos. Things like this make your resume very interesting and even like a portfolio. As we are all well aware, working on your resume once it has been printed is an impossible task. One of the worst things you can do is use a whitener on your resume in order to correct a typing error which you made. However having an online resume is beneficial simply because you can make changes or correct errors even seconds before you send in your resume. This indeed proves to be a saving grace. Sending in a resume with a mistake will indeed create a very poor impression in the mind of those who are going through your information. 16. Doing it is free! Finally, though many people might not openly state it but money is indeed a valuable resource. People work hard to earn their money and they try their best to look for ways to minimize their expenditure. Posting your resume online is great mainly because it is something which allows you to gain so much visibility as well as contacts and that too all for free. Posting your resume online will not cost you anything and it is something which can be done in a matter of a little time. So why wouldn’t you take this little step, if it can help you further your career? As all of us know, there are two sides to every story. 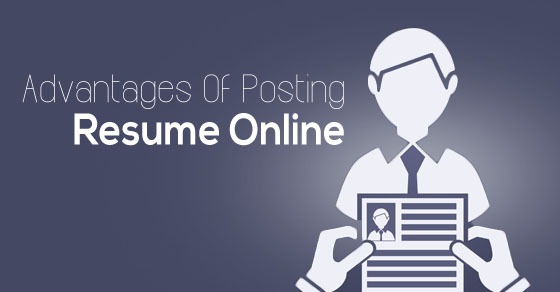 Though there might be some disadvantages of posting your resume online, the positives far exceed these negatives. The main disadvantage of an online resume is that you cannot tailor your resume to suit the needs of each individual company. This is something which often limits your chances of bagging a job. In addition to this, having an online resume with an image of yourself as well as all your contact details mentioned is rather unsafe. So ensure that you weigh carefully the pros and cons of posting an online resume before you take any further action.